Lately, I have been working on some projects that are not ready for me to share just yet, so I have been posting some art inspirations that my children have created. This past weekend we had the pleasure of visiting the craft store. The closest craft store to us is 45mi away. So, going to the craft store is a real treat for me! I hardly ever have time to go due to our busy schedule! I usually order most of my art supplies online. While we were at the craft store, my daughter decided that she wanted some modeling clay. She has quite an imagination! I always encourage art in our house and will buy any art supplies that they desire. I know that if they get tired of it, I will have new toys! Hehe. 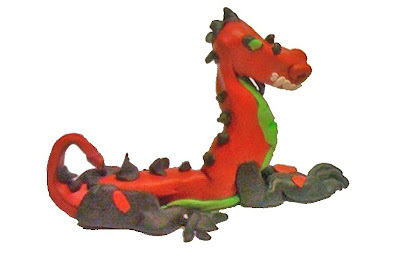 I have posted a red dragon that my daughter sculpted. She is into dragons right now. Her sketch book is full of them. I can't wait to see what she come up with next!